The recent news that one of the UK's most well-known gaming celebrities had returned from the wild to begin a new YouTube channel caused quite a stir recently, but not just for nostalgic reasons. 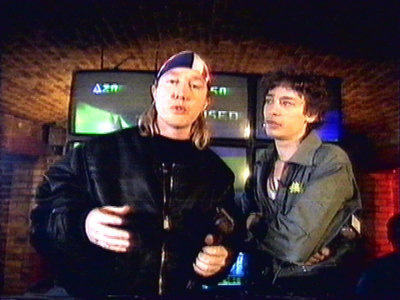 Dave "The Games Animal" Perry might not be famous outside of the British Isles (and even then, Brits under the age of 35 are unlikely to be familiar with his work), but back in the '90s his face was seen on GamesMaster, the massively popular TV show he helped to create, and he was considered to be one of the best players in the country. His tenure on the production ended rather acrimoniously, and after opening his own magazine publishing business he eventually walked away from the games industry altogether to establish a very successful tattoo parlour. We caught up with Dave to speak about his recent return to the world of video games. Nintendo Life: After years away from games, you're finally back in the industry. What's the response been like from the gaming community as a whole? Dave Perry: Absolute chaos and Perrymania! My return seems to have driven a wedge through the sleepy 21st Century Games World with people almost immediately choosing sides. Thankfully there seem to be more lovers than haters... but that can change! But there really is no need for all the madness. I love games. I want to help add a little colour to gaming again, and ultimately I am hurting no one, just doing my thing. If you don’t want to join me on this new adventure then don’t. Simples. Back in the day, the industry was very much Sega vs Nintendo, then Sony got into the mix. What do you make of the playing field today? Blurred. When I was playing competitively you had one console or the other, one computer or the other. An Amiga or an ST. NES or Master System. Mega Drive or SNES. Now people have so many different machines in their homes... where’s the brand loyalty? I loved all of that. Do your homework. Pick a side. It made you more enthusiastic about your format. But I guess some people would say it is good to have options... I'm not so sure. Do you still game very much? I am an avid iPad gamer. I play War Dragons three or four hours a day. I love it. But I also still play PlayStation, Xbox 360 and of course my Arcade Cabinet at the shop as often as possible. But I just don’t have the free time I used to. I still get MCV and keep an eye on the industry, but to be honest, it has become very dull and corporate. Where are the mavericks? The rebels? The characters, outside of the games themselves? 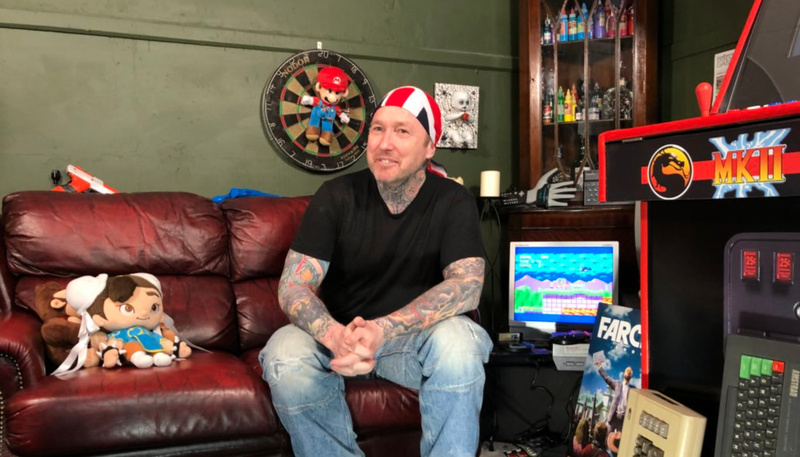 You obviously run a very successful business outside of games now; do you ever get anyone coming into your tattoo parlour who recognises you from your gaming days? Yes, it happens all the time. But most of my regulars are really cool about it. They know me as Dave, not the Games Animal, and so we relate on that level. Occasionally someone wants a selfie, but not so much that it becomes a distraction. I am always amazed at how much those old TV shows meant to everyone. Amazed and proud. You've said in the past that like so many UK players, you picked a side in the '90s and that side was Sega. Why is it you've never really gotten on with Nintendo's games and hardware, and do ever think that stance will change? I don’t know. It was just how things turned out, with me working for [UK magazines] Sega Pro and Mega Power. If I remember rightly, the Mega Drive landed in the UK long before the SNES and so I ran with it. Great games, good vibes, I didn’t really consider another format at the time. Eventually games like F-Zero, Super Mario Kart and Street Fighter II had me cheating on my Sega console, but on the whole, I am not a fan of cute characters with huge heads (ironic really) and Nintendo always seemed to have too many of them. It just felt younger and less edgy. I am always open to change, but with products like the Wii and Switch, I have seen nothing to make me think I was wrong in my choices. You've relaunched The Games Animal brand with a new YouTube channel. What are your long-term aims with this approach? Do you see this evolving into a full-blown show with guests, challenges and the like, or is it more of a personal project? I was persuaded to do this by gamers who remembered the old shows and craved for something a bit more colourful and authentic than the current gaming media on tap. It was not something I ever wanted to do, but I listened to popular opinion and learned the basic skills so that I could put together a very personal and low key show together, that would appeal to fans of old games and '90s gaming nostalgia. I would love it to become bigger, but I have no budget and very little time. So this is just me, having some fun and giving something back. If people don’t want to watch it, all I’ve lost is time, but at least I put something out there for the loyal game fans that requested it. You've gone for a rather risky tone with the first episode, aping the 'in your face' approach that was used so much in the '90s. To speak candidly for a moment, was this a parody and was it done to get attention at a time when social issues like misogyny and sexism are being tackled everywhere, and will the format settle down in future episodes? I plan to do whatever I want with the show. I am not trying to win awards, make money or please backers or paying viewers. This is me having some fun. If people want to watch, then they can watch. If not, then they can f*** off and do something else. I am not asking for anyone’s opinion, nor are there very many opinions that I would value anyway. Social Issues and sexism have gone absolutely crazy, and to be honest they drive me crazy. I have no time for all this 21st Century bulls***. Let pretty girls be pretty girls, let clever girls be clever girls. If a girl in a bikini is now considered sexist, well, the world has gone to s***. I have no format. This is just me, doing what I want. Having fun with people. Is it fair to say that the whole 'Games Animal' approach is very much a persona; a mask you wear which was very successful back in the day at creating an image of cocky brashness and confidence that suited the prevailing tone of the time? If you like. I grew up in the punk years. A time of great rebellion and strong attitudes. I don’t like rules, I don’t like bullies, I don’t like anybody who tries to enforce their will, beliefs or restrictions on anybody. So I don’t deal well with the idea that I can’t do something. The Games Animal was a character that grew out of my cocky younger years. It was designed to stand out, to be memorable, to get noticed. And to wind people up. Add to this the fact that I was the best gamesplayer the country had ever seen and you had a winning formula – but one that drew massive negativity and jealousy from many of my peers. Today, I am still that guy, just a lot s****er at games. I really don’t care what people think, which makes all the negative comments people write all the funnier. What a waste of time. Given that you were involved in the games industry in several capacities – including retail, publishing and TV – just as it was on the rise in the '90s, you're ideally placed to share an intimate oral history of developments, at least from a UK perspective. Will you be doing that with your YouTube channel? Absolutely, as you can see from the setup. A lot of this channel will be me sat there talking about the golden age of gaming. Changes in the industry. Old magazines, TV shows, my favourite games – that kind of thing. I have so many stories to tell to those who want to hear them. Remember, mine was a very unique career. There had never been a professional gamer like me before and there hasn’t been one like me since. National newspaper articles, style magazine awards, store openings, TV shows... I’ll tell you about them all if you subscribe. Not interested? No problem. Let's address the elephant in the room - Super Mario 64. We all know what happened that day and both you and Dominik Diamond [GamesMaster host] have shared your views on events. Setting all of that aside, do you really hate the game? Do you think you can ever appreciate it for the groundbreaking title many others consider it to be? I can’t say that I hate or love the game... I just have no desire to play it. A dumpy little plumber with a cheesy Italian accent running around jumping on boxes is not my bag. I hate that kind of game. Yes, the 3D environments were pretty groundbreaking at the time, but the basic gameplay itself was nothing new. It was a good flagship release for a new console at the time, but that’s as much credit as I will ever give it. Yes, of course. That has to happen really. This time maybe I will know what the buttons do. What would you say is your favourite Nintendo game, and why? Super Mario Kart is just pure, unadulterated racing joy. The one thing Nintendo has always been good at is multiplayer gaming. Social gaming. Not the rubbish we see over the internet these days, but a bunch of people in the room together playing against one another. That is gaming at its best. And no game does this better than Mario Kart. It appeals to all ages, and despite still being cutesy, the gameplay is simple, yet demanding enough to bring out the Games Animal in anyone. We'd like to thank Dave for his time. Still bitter about Mario 64 I see. I remember watching the Christmas special and laughing at him for being such a sore loser. He said he hadn't played it before but then why was he trying to go for the secret tunnel? Either way I was so hyped for Mario 64 and watching them play it just got me more hyped. When I finally played the game it was magical. No other game has had quite the same impact since. To hear his view on the game just confirms I won't be going anyhwere near his youtube channel. Edit 2: He was not going for the tunnel has was going for the more audacious and difficult shortcut where he cuts out half the slope. It's refreshing to hear people speak their mind and get on with what they want to do rather than walking on eggshells and pandering to mass acceptance. Good luck to him. other platforms? Pretty laughable stuff really. Oof. Probably a nice guy, but his attitude towards video games is definitely not modern. Looking forward to hearing his stories and memories. He's not everyone's cup of tea,but he's right about modern gaming. Yeah coz pretty girls can’t be clever. What a caveman. Put this freak back In his cave. Never played the game but went for the secret tunnel.. The guy is a fool. I think being from the UK really helps you understand where Dave (or at least his character) is coming from with this stuff. Whilst I don't agree with everything said, he's on the money when it comes to how stale/corporate the games industry has become in recent years, however, the budgets/costs are now huge though so that's hardly surprising. Dig a little deeper and the indie scene is far more like the "golden age" of gaming, so it's not all doom and gloom for the future. Even without the obvious sexism, I've got no time for this fool. Obviously he doesn't care what his "fans" want, his archaic views on gaming need to stay in the 90s. Brand loyalty shouldn't exist. As a consumer I'm lucky enough to have a ps4 and switch and that gives me more scope to enjoy games. I think it also gives developers more of an opportunity to develop interesting experiences and not be hindered by one machine's specs. Then you feedback his comments about women and you realise he's a bit of a wet willy. His comment on Nintendo and mulitplayer is on point. You are right. Just had to remind myself and watched the clip on youtube. He was actually going for the more difficult shortcut where you jump and try to land on the lower track. So not only had he played it he knew all the tricks! Why does everyone new going on about the secret tunnel? He was never going for the secret tunnel. He was aiming to drop off the slope on to the lower half of the track right near the end of the course. Cuts about 20 seconds off the time if done right....he obviously ballsed it tho. Seems like a bit of a w**kstain if i’m being honest. Of course, we all know that TV show hosts from back in the day are infallible, right? 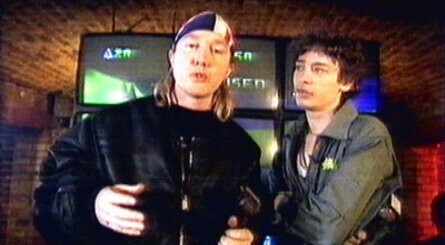 Watched every single Gamesmaster episode growing up, I have a lot of love for Dave. I also love his non-PC view of everything nowadays! @nmanifold I think you just hit the nail on the head there. I can see (and understand) why Dave is getting a lot of heat from people who are either too young to remember him or don't live in the UK, but his attitude is totally in keeping with how he was back then - and, to be fair, how a LOT of the games media was. The magazines back then - like Crash, CVG, Mean Machines, Amiga Power, etc - all had this very funny and slightly edgy tone, and Dave is a product of that era (as am I, if I'm honest). I might not agree with a lot of what he's saying, but I respect him for saying it. Repeat after me: midlife crisis. As for his comment about characters in the industry and not in games: among devs the "characters" you get are usually the kind of Phil Fish and his ilk. Full of themselves, entrenched in their cliques and deplorable, screaming about sexism but covering for the sexual predators on their own side. Then there's the youtubers and streamers, though sadly the one with some class (and a soothing radio voice) died. Frankly, showing some girls in bikinis is hardly sexist. Lowbrow and primitive, but people like looking at pretty people. If pretty women want to exploit their appearance for money, who are you to stop them? If I had the bod I would totally become an underwear model. Sonic is the opposite of edgy. He is a cartoon hedgehog who was based off Mickey Mouse, that is slightly impatient. The only reason he ever seemed edgy was how he was advertised. One can agree with him about today's social outrage and political correctness while still finding him objectionable. > If you don’t want to join me on this new adventure then don’t. Simples. We will have to agree to disagree on this one as it looks pretty clear to me from watching the video again. I genuinely lol'd at this. I may not agree one to one, but I share a slight sentiment all the same. And Mario on the dartboard... love it! @AcridSkull Andy and Violet were better! @Damo I agree with the attitudes back in the day, but the world changes and you have to change with it. If you don't, you come across as an ignorant fool who is out of touch. That's why he's getting flack. It's fine to act as a personality and be outrageous, but deliberately alienating people is a duck-move. It's just undoing and undermining the work that's been done to try to create an inclusive gaming community, which is blooming fragile as it is. Oh...and video games and what not. Agree about the blonde to the post above. Now about him saying the Switch does nothing to change opinions about Nintendo from the 8/16bit era is a bit blind, arrogant, and honestly just downright ignorant. Sure there is that Mario game, and? What about all the other stuff from not just them but finally third parties again? The average age level perception and reality have ticked into higher levels anyone can see. But whatever, if he hates Mario 64 that much, enjoy watching him suffer. This is the first time I've even heard of this guy. Seems awfully arrogant and ignorant of the gaming industry. No brand loyalty? Sony has a rabid fanbase who will defend the Sony name to the death. Besides, brand loyalty shouldn't even be a thing. Why be loyal to a corporate entity? @Kidfunkadelic83 The aim of the challenge was to stay on track the longest ,not fastest time though. @AcridSkull Dave Perry. As the whole article is about him and Gamemaster, I'm surprised I had to explain that to you. This guy lost me at his argument for brand loyalty. I didn't even make it to the sexiest stuff. Sorry, not going to be blindly loyal to a corporation that's just using me to make money. Also, how is that edgy? Seems pretty mainstream to me. To be fair, back when I were a lad you were either a Sinclair ZX Spectrum user or a Commodore 64 user - there would be playground arguments about this. You were one or the other, I can't remember anyone having both systems. You pinned your colours to one system, and that carried on to and maybe beyond Gamesmaster. This was well before PS and XBox (and mobile phones) remember. Different times. I never warmed to Mr Perry, but at the time gaming was kinda exciting, a tiny bit Rock n' roll, bit rebellious, the 'olds' didn't get it - previous generations had music, we had music and games as ours. To spread though word of mouth, to - yes, I know, 'piracy is killing the game industry' - copy and swap games. As @Damo said, the magazines (and Gamesmaster) reflected that, the industry was a lot more 'loose'. It's incredible to think of now, when you sit through the credits of any modern game, but the programmers used to be 'stars'. Matthew Smith (Manic Miner, Jet Set Willy) Jeff Minter (still going I believe? ), Geoff Cramond even had his name above his F1 game. @SBandy the guy literally ruined his television career because of how he reacted to being set up on a game he knew nothing about. If he was good enough and played long enough to work out the shortcut why would he not just complete the course as his opponent had already failed? Don't forget the game and the console weren't even out in the UK then so he couldn't have played it. @Damo So was the interview conducted as his persona, then? Did he become his persona through the traumatic event of not winning one competition? He talks in exactly the same way as his supposed persona would, anyway. @Kirby-in-Kirkby I was giving you the benefit of the doubt, but it turns out you were actually comparing a regular guest on a TV show to the presenters of a different TV show. Makes no sense. Also, I have no idea why you're randomly telling me. @jswhitfield8 exactly..I could NEVER pick only a switch or a PS4. I need the best of both worlds. Otherwise I'd be deeply missing out in the past as I did with certain titles on the snes and n64. I owned the Genesis and PS1 although I played a fudge ton of SNES games as if it were almost my own at friends house(which i enjoyed immensely more than the genny)nd to a lesser extent the n64. Big regrets not getting the snes back in its hayday. Makes me sad I stuck with the Genesis. @AcridSkull, my apologies, I mistook your imagery of an old man to 6 or 7 posters as a good natured bit of banter, rather than the obnoxious response it really was. I won't make that mistake again. Is he not the same David Perry that worked at Virgin/Shiny making video games in the '90s? "I really don’t care what people think"
And that's why your day is done. Gone. For 20 or so years now. People who do care about things and others have taken over. Go live in the past. The present is far more caring and considerate. I like this guy. He has a personality. SM64 has extremely boring story and characters. He is right about that. He is obviously very into the story/characters of a game, so he doesn't like SM64. That's fair. I think he conflates gameplay with story and character though. He doesn't like the story/characters, which indeed is the same old and flat stuff that Nintendo had done many times already. But he then project that flatness onto the gameplay itself, and says it's not novel. The mechanics of SM64 were very novel. Where other 3d platformers basically did the obvious transformation of 2d mechanics into 3d by creating a sort of track to maneuver through, or smaller 3d versions of maze puzzles, SM64 added exploration and freedom and play on a whole new level. Many people happen to like sandboxy games like this. Where you can play with skills, doing what the game designer didn't even have in mind, and so on. And SM64 added a lot to this scene. It took me probably 5 years to get all stars in SM64, but I played around with the mechanics, trying impossible wall jumps etc, more than any game before or since. These days I can still watch youtube recordings of the game for hours of people doing crazy things. Could the game have been better with more story? Perhaps, but it might also have taken something away. I think I projected my own feelings into mario and I still remember how incredibly cool it was when Mario jumped out of that pipe, and then the game giving me this freedom to run around right from the beginning. I felt like I was Mario. Not sure it would have been the same with some contrived story about who Mario is, what his background is, etc. @wonderclassic Hah. I think you are conflating caring about what people think of you with caring for people. This is indeed typical of the times, but you are pointing out so much more about your generation then about his in your statement. @wonderclassic I have never heard such bologna. Pure hogwash. These days everyone only seems to be concerned with their own narcissism. That is the opposite of being caring of others. I gotta give Perry some credit for not falling victim to the toxic mentality that plagues so many of today's social networks. @JayJ I like him too. Feel I gotta say that, before someone conflates a bit of disagreement for hate. @Mortenb Yeah I gotta respect someone like him who isn't just trying to fit the mold of whatever hivemind people are trying to push these days. Love him or hate him, he is who he is and he isn't afraid to be that person. I vaguely remember this guy. Being known as 'one of the best players in the country' and throwing a massive hissy fit when he lost and walking away from the games industry entirely forfeits his credibility to be quite honest. Why is this on the Nintendo page? This belongs on the Dreamcast sister-site following it’s last update in 2005. Also, loving the big-headed Chun-Li plushie pictured next to this anti-chibi/cute doofus; way to troll yourself, clown! Finally, a white, hetero-male decrying the increasingly PC world we live in? How awful it must be to be you...to have to consider your words before you speak/type. It’s almost as if you’ve lost a gallon of your entitled, oceanic privilege; pity pity.